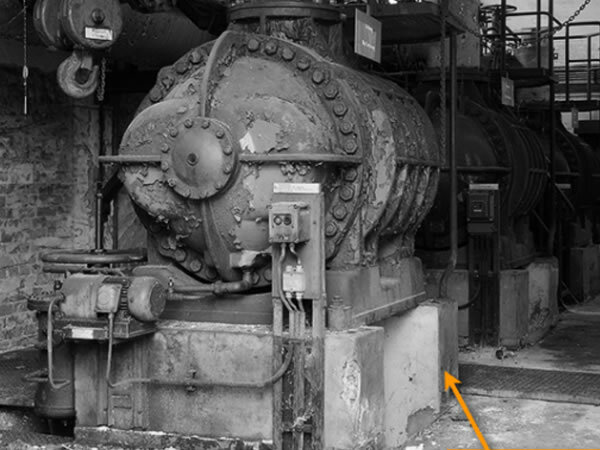 In part six of the boiler series we'll move into Photoshop and begin creating our textures. In this part of the series you'll learn how to combine the ambient occlusion maps we generated last time with image based textures to create a detailed Diffuse map suitable for our model's aged look. We'll also look at how Photoshop's layer styles and masking options can be utilized in conjunction with hand painting techniques to add additional detail and depth to our map. We'll start with pretty much the basics and create a new file, under which make two copies of your ambient occlusion map. "Layer 1" is your UV screen shot and "BG" is a layer filled with Black as the background. Here is an image of both Occlusion layer's blending modes. The bottom one was kept on "Multiply" with an opacity of 80% and the upper one was set to "Soft Light " with an opacity of 67%. Now create a New layer and name it "GreenBase" as our first color block of the diffuse texture. Now just press "CTRL+U" to edit the "Hue/Saturation" and give the Hue a value of +38, the Saturation a value of -8 and the Lightness a value of -46 to increase the lightness of the base texture. Now as we have still not reached the desired result, we'll do some more tweaking. So again go to Adjustments>Selective Color... (1) and then in the newly opened window, first select the "Green" color from the uppermost tab (this will allow us to only affect the greens in our image.) Then set the values of Cyan to +28, Magenta to -31, Yellow to +14 and finally Black to +23 (2.) Now this gives our texture much more contrast and realistic rust and metal tones. Now a little tweak using "Hue/Saturation" again setting the value of Saturation to -20 only. Now we'll move onto the Rust texture. So I have brought a plain rust texture into Photoshop from my collection of textures (1) and using the same procedure of duplication, we'll fill the whole area with it (2.) While doing the scaling always keep in mind the actual scale of the texture according to the surface. Now tone down the saturation to -41 using "Hue/Saturation" and finally we'll change the Blending mode of this layer from "Normal" to "Darker Color". Now we'll add few more metal textures to give it some extra detail, so bring one texture in just like we brought the other textures into this PSD. Now we need to make this texture seamless while duplicating it. So keeping the same selection, duplicate it and then press CTRL+T and then Right-click > Flip Horizontal (1) and it will do as it said, and then there will be no visible seam in the texture. Though it will make the texture mirrored, we're gonna use it with a blending mode so it wont be visible. Now make a selection of the whole area, then Duplicate and place it over it and then again Right-click > Flip Vertical (2) and it will again remove the vertical seam from the texture. Now name this Layer "Brown_Metal_01" and make a selection of all the metal areas and then Invert the selection and Delete the area. Then bring in the other two metal textures and name them "Brown_Metal_02" and "Brown_Metal_03" respectively. Now set the Blending mode of the "Brown_Metal_01" layer to "Vivid Light" and "Brown_Metal_02" to "Hard Light". Set this layer's Blending mode to "Vivid Light" and also change the name to "Metal_Grunge" for better identification. Now we'll add some more grunge using image textures only. Name this layer "Dirt_03" and set it's Blending mode to "Overlay". And we'll move onto the Concrete wall base using another image texture and placing it over the wall UVs only. Now just place this layer above both Occlusion layers to get a better result. Now we'll add some more surface details like leakage on the concrete walls. Place the Leakage texture over the concrete wall base, name it "Dirt_02"and set it's Blending mode to "Multiply" as shown. Now to add some ground dirt, just a little color tweaking via Hue/Saturation by changing the values of Hue +9, Saturation +66 and Lightness to +24. And just to check the proper opacity of this texture, we'll keep the visibility of the "Concrete wall base" off. Now at the center piece of the boiler, make a selection of the middle edge loop (1) and then Right-click > Feather... (2.) This will soften the selection, we'll learn in a later step what's it used for. Now under the Feather Selection options, set the Feather Radius to 3 and then create a New layer and name it "Shading", then press Right-click > Stroke. Now under the Stroke options window, set the Width to 1 px and set the Location to "Center". This will create a stroke at the center of that selection, giving it the illusion of a self shadow, adding a bit more depth to it. Now to add some more shading to the shape, create a New layer and keeping the same selection fill it with a White color (1), and then set the Blending mode of this layer to "Darken" and later name the layer "Shading_02". Now we'll paint on some shading. So for that select the Brush tool by simply pressing "B" and then from the left corner of the screen select the brush type "No. 17" as this is a soft brush that works really well while painting soft shading. The brush size you can change simply by using the [ and ] keys, and you can always tweak the opacity and flow of brush from the same upper section of the UI. But first create a New layer named "Shading_05" and set the Blending mode to "Overlay", with an opacity of 51% and then carefully paint the the black color over the UVs. Later I Changed the opacity to 59% for better visibility. Here I've added a Broken Wall texture to a new layer named "Broken_base" extracted from some random concrete texture. Now onto a New layer named "Darken" with the Blending mode set to "Darker Colors" and using the same brush with various colors (Black, dark tones of Green and Blue mainly) I've painted over the wall base, metal control panel and base to give it a more used feel. Then select the mask and fill it with a Black color (2.) Now this mask will work in such a way that any areas painted with black wont be visible and areas painted in White will be visible in the layer. This is just like erasing non wanted areas from the layer but it's not destructible, we can easily go back to an area which we have deleted somehow but want again, which is very useful when having a lot of layers of detail. Now select the same brush again which we've used for painting the shading earlier and start painting with a White color in the layer mask over the surfaces where you need some more rust. Here are the screens of all the areas where the Rust had been painted using the same masking technique. And here are the final screens of the painted rust. Now simply make a copy of the same rust layer again, Desaturate it by pressing "CTRL+Shift+U" and then place it just over the "Metal Grunge" Layer, again fill the mask with a Black color and start painting where we need some chipped off paint. This grey metal will give a feel of bare metal as in the actual paint has been chipped off and the base underneath has been exposed. And here are the screens of what's achieved using the Grey metal with masking. Even the small Scratch details are achieved using the same procedure. More surface details added, like scratches and chipped off paint. Now Here is the final diffuse texture, using photographic and hand painted textures. And here is our Low poly model with the Diffuse and Normal maps applied on a default blinn material. The next part of the tutorial will cover the Specular map and use of the Xoliul Shader in Maya, that will give almost real-time results in the viewport.